I started running in Dec 2013 after being given the book Running Like A Girl by Alexandra Heminsley. I was in my 40s, hadn't run since school where I'd never been one of the sporty girls', but I was determined to give it a go. I followed a training plan I found online, which looking back now was pretty tough alone. 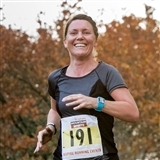 I entered my first 10km race in March 2014 and my first half marathon in September the same year - I was hooked! I met Hannah Lees aka Hannah the Runner at my first Parkrun in Bath in 2015 and she encouraged me to become a volunteer run leader, so I started leading 5-10km social runs around the Bath area. On a personal level, I have now run many more 10km races and half marathons. I ran my first full marathon in October 2016 and have just run my sixth alongside Hannah Lees at the Women Can event in Devon. Running has not only helped me become fitter, but it is also fantastic for my mental health. It gave me the courage to qualify as an England Athletics Coach in 2017 and I have since been leading couch to 5km courses as part of Hannah the Runners team. Helping people to start running and sharing their joy when they achieve their first 5km is so rewarding - I love it!